College decision deadlines are fast approaching, and there are many factors to weigh when narrowing down the prospects. Academic strength, value, proximity, and student life are some typical considerations to keep in mind. However, many students find success and satisfaction at institutions dedicated to community engagement and service. In addition to researching service initiatives and community projects, students can find service-oriented schools by referencing The President’s Higher Education Community Service Honor Roll. The President’s Honor Roll recognizes colleges and universities with strong community connections that encourage students to pursue civic engagement and solve community problems. Schools that receive this award are encouraging their students to excel both in academics and in committing to meaningful service. FAU has been encouraging its students to engage in service since 1996 when Associate professor Daniel Weppner urged the university to encourage its students to pair learning with volunteerism. In 1996 the Campus Volunteer Center (CVC) was opened to provide resources to students. Since its inception, the CVC has aided in establishing several service-oriented student organizations. 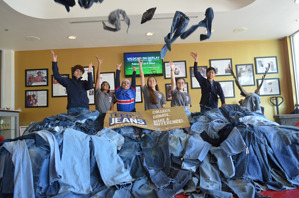 The aim of service-learning at FAU is to create meaningful partnerships between the university and the community in order to connect students’ education with service. In 2007 the CVC was renamed the Dr. Daniel Weppner Center for Civic Engagement and Service in honor of its founder. FAU students create a Noble Impact™ by engaging in their community and tracking more than 350,000 hours on NobleHour. Nazareth College holds a reputation for its rigorous commitment to service. Fall orientation begins with a day of service, but this is only the beginning. Taking initiative in one’s community is an expectation and a part of everyday life. A new addition to the curriculum requires that students complete one experiential learning opportunity by venturing into the community and being civic-minded. Service is an integral part of campus life, alongside attending lectures and writing papers. Nazareth College officially considers volunteerism and service in admissions. With nearly 13,000 of its approximately 15,000 students involved in service-learning programs, the faculty at Miami University is making constant advances to its curriculum by finding more ways for students to combine learning with service. The university boasts several partnerships with local partners and school districts. For example, early childhood education majors work with local elementary schools; the elementary students benefit from tutoring in school, and the university students gain valuable experience and make valuable community connections that often carry on into career pathways. The school has made an effort to incorporate service-learning in 75 courses and continues to train faculty in teaching service-learning. 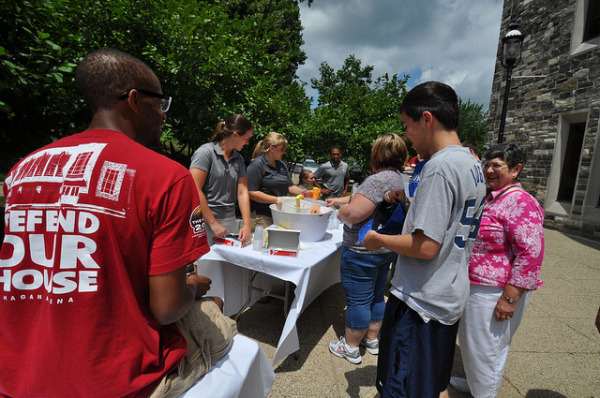 Miami University uses NobleHour to connect with local community partners. The George Washington University actively considers and integrates service into its academic options for students. The service-learning opportunities at GW focus on four areas: academic service-learning, community service and engagement, service careers, and social entrepreneurship. This holistic approach to service means there are opportunities for every student at GW, ranging from just donating a few hours a month to synthesizing entrepreneurship skills with service by starting an entire social enterprise. GW offers more than 45 service-learning courses such as Writing for Social Change and Service-Learning in Advanced Spanish. GW aims to spur a “culture of service” among its students by providing a bounty of resources to connect students to their community. GW students tracked more than 44,000 hours on NobleHour in 2013. 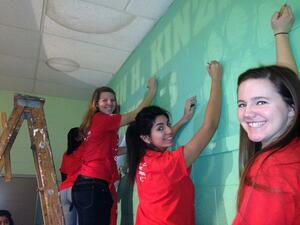 College students across the country are gearing up for MLK Day of Service on Monday, January 19. What used to be just a day off to sleep in and catch up on homework has become an exciting day for young adults to actively engage in their community through volunteering. Dr. King would be proud to see today’s youth answering that question with action. From painting schools and creating gardens, to visiting with the elderly, working in a food pantry or helping out at animal shelters, college students across the country are poised to make a difference this MLK Day of Service. NobleHour is also proud of the amazing community work performed by its members. Coast to coast, our network of universities are engaging their students in a variety of projects to make a difference in the lives of those in need. Just last year, at the University of Pittsburgh, Janard Pendleton, the program coordinator for Pitt Serves said there were quite a few organized service activities for students and staff to help others throughout the Pittsburgh community. 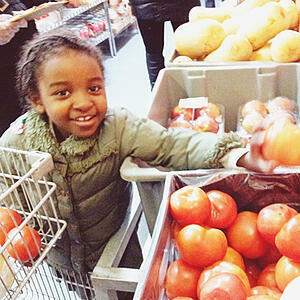 In 2014, over 700 students signed up to volunteer at local organizations like the Greater Pittsburgh Food Bank, the Department of Veterans Affairs and the Pittsburgh Botanic Garden. 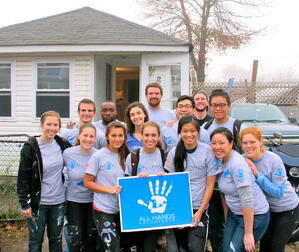 The George Washington University has participated in the MLK Day of Service since 2001. Last year, over 600 students, faculty, staff and alumni signed up with the school’s Center for Civic Engagement and Public Service to work together on a number of direct service projects throughout the D.C. area. The school also offered on-campus CPR training facilitated by EMeRG as part of their MLK Day of Service programming. Volunteers last year revitalized a student garden, adding a new herb garden. They also painted stepping-stones to create a pathway, and painted murals on the playground. Luciani said their goal is to take this one day of service and turn it into something more long term. “We selected that school because one of our student organizations was already partnered with them. It’s an opportunity to expand and get more of the campus community involved." Luciani added that their partnership is strengthened by having alumni and student groups follow-up with the school with return visits throughout the year. 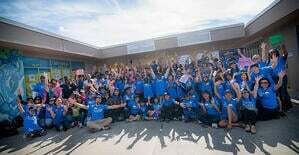 Students at Emerson College Los Angeles also worked to spruce up the Horace Mann Middle School. Volunteers with City Year painted educational murals, inspirational quotes and college logos throughout the school to help make a more engaging learning environment for the students. Miami University’s Office of Community Engagement and Service has a number of projects set up for MLK Day. 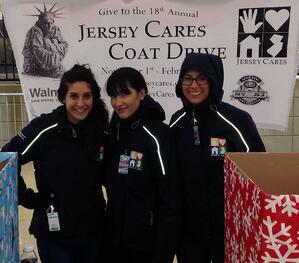 Students will volunteer locally in the community at various organizations. Last year, students played bingo with the elderly, stocked food at the Oxford Community Choice Pantry, and worked with animals for the Animal Adoption Foundation. Volunteers in Ohio also helped paint and refurbish a property purchased by Sojourner Recovery Services, a non-profit that provides substance abuse treatment for adults, adolescents and their families. Eileen Turain, development director of the organization, said she enjoys working with the students from Miami University’s Hamilton campus and the Connect2Complete program. "We've worked with the students before and they've been very helpful. 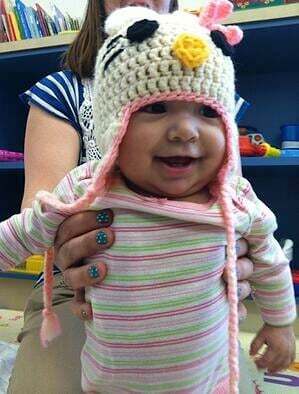 This facility helps people needing and wanting our services and programming." The MLK Day of Service is also a day of celebration. 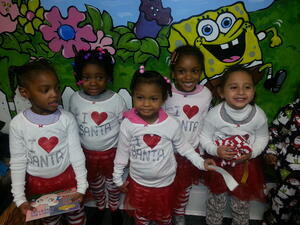 Many organizations incorporate festivities along with their service projects. In addition to organizing a number of volunteer opportunities and educational activities, Greenville Technical College in South Carolina had a Giving Station last year for students at their Barton Campus Student Center. Students made donations to Habitat for Humanity of Greenville County, and also rotated through service stations where they made sandwiches for agencies serving the hungry, appreciation cards for veterans and service members, and created toys for groups helping animals in shelters. Dr. King said, "An individual has not started living until he can rise above the narrow confines of his individualistic concerns to the broader concerns of all humanity." This MLK Day, find time to address the broader concerns of your community. Join hundreds of thousands of people in making an impact. If you’re still looking for volunteer opportunities, visit the NobleHour website or the MLK Day of Service website for listings. Remember, it’s not just a day off. It's a day for you to be on and active in your community. Don't forget to let us know about your MLK Day of Service projects so we can share the good news! 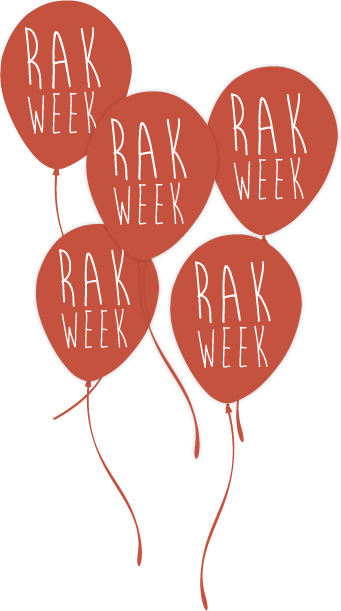 Photo credit: Erik Jepsen/UC San Diego Publications. A New Year is upon us. Every January 1, I think about the resolutions I’ve made in the past and resolve to do again– eat better, exercise more, be more patient, get organized, etc., etc. While these are good resolutions, most of them really only affect my family and me. So, I decided, my resolutions should be about something more than just improving myself. It’s time for me to help others – not in some grand way, but in simple ways every month. Therefore, rather than working on my resolutions just one month a year (January) and forgetting them the other 11 months, I’ve decided January is my starting point. As we approach the Dr. Martin Luther King, Jr. Day of Service and reflect on his message of civic engagement, let us embrace the fact that one person can make a difference. Just imagine if we stay true to that and what can happen with millions of individual acts of kindness and service. If one of your resolutions is to volunteer more, then this January 19th, the MLK Day of Service, is the perfect day to begin your transformation. According to the Corporation for National and Community Service (CNCS), volunteers across the country pledged over 1.3 million hours of service in 2013 for the MLK Day of Service. Established in 1993, CNCS is a federal agency that engages more than five million Americans in service through programs like Senior Corps, AmeriCorps, and the Volunteer Generation Fund. Start local and check with your student’s school’s service coordinator. Find out what they are doing and ask to help. 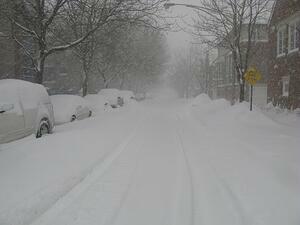 Chicago Public Schools has different events planned for the month of January. In 2014, teachers signed up for specific events ranging from working with food pantries to educational seminars aimed at reducing handgun violence. Teachers received curriculum and follow-up materials to connect the activities to MLK Day. 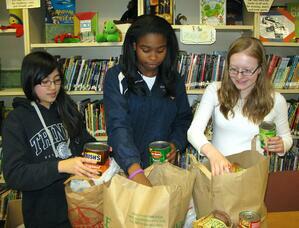 Hundreds of students participated in organized community service activities throughout the month. “All of the events are about building the community through volunteering, the goal of Dr. Martin Luther King, Jr.,” said Ryan Evans, who works for AmeriCorps Vista in the CPS Literacy department to coordinate community service learning opportunities for students. If you prefer to do something outside of school, then consider calling your local faith based, community or non-profit organizations. Many have on-going service projects and are always looking for volunteers. The NobleHour website also lists thousands of community engagement opportunities throughout the U.S. Another option is to check your city or state’s website for information about volunteer programs. The MGR Foundation, has locations in Chicago, Pittsburgh, Charlotte, the Twin Cities and Las Vegas. The non-profit provides direct service to communities with a variety of programs. Chicago Cares honors Dr. Martin Luther King Jr.’s message of unity through community service. Tens of thousands of volunteers participate in service projects each year through the non-profit service organization. Last January alone, approximately 1,400 people served in honor of Dr. Martin Luther King, Jr. specifically (either as individuals or through their corporations). 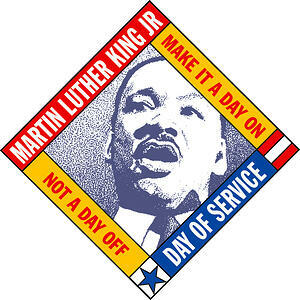 The MLK Day of Service website can also help direct you to local opportunities to perform community service. If you can’t find anything that moves you, create your own project with MLK Day Toolkits. Topics range from disaster services and education, to the environment, health and writing letters to the troops. My daughter and I decided to make sandwiches for the homeless the other day. We filled bags with PB&J sandwiches, fruit, granola bars and a few pieces of chocolate. We took the train downtown and then handed out the bags to homeless people we passed along the way. 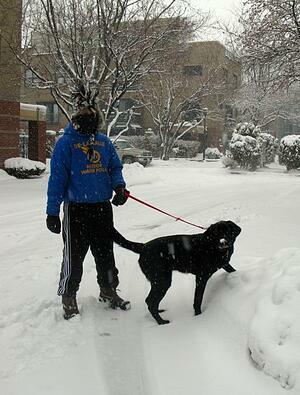 It was a cold day and there were not many people out, but we were able to help at least four individuals. It wasn’t much, but it was a start in our New Year’ resolution to help others. It didn’t require a lot of planning and we had everything on hand. It was a simple act that we will strive to do more often. In 2010, Pew Research Center’s report Millennials: A Portrait of Generation Next found that young people are more likely than older age groups to volunteer. 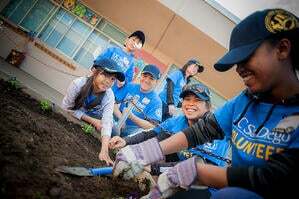 Many young people are tapping into the resources at their schools to volunteer, serve and better their communities. At Iowa State University, students have formed the CyServe Council to promote volunteerism among students. The need for such an organization was identified because “...community service is something that is often put on the back burner for students because of all the other exciting opportunities that exist in the college atmosphere,” according to the CyServe website. The organization seeks to “bring volunteerism to the forefront of student minds and promote the idea of continuous community service.” CyServe provides comprehensive resources for students to engage in service, including six service days each year to celebrate the spirit of giving back. Organizations like CyServe are important because they act as a liaison between students and the community in need. The Duke Partnership for Service, or dPS, is a student-lead initiative that works to promote “service culture.” dPS is comprised of more than 70 student-lead service groups at Duke University. dPS provides resources for its organizations to succeed in changing their community. dPS works with each service organization to help it find funding and volunteers. Furthermore, it makes sure that service efforts at Duke remain concise by ensuring the efforts of different organizations do not overlap. dPS helps the organizations under its roof to work collaboratively and effectively. Essentially, dPS is a network of student-lead service groups working to optimize the impact of service oriented students. At UNC Chapel Hill, APPLES Service-Learning is a service organization that has been working to promote service and volunteerism in the classroom since 1990. The program falls under UNC Chapel Hill’s Carolina Center for Public Service. The focus of this student-led initiative is to provide comprehensive resources to students and faculty about service-learning. The organization does this by forming strong partnerships within the university and with the community. APPLES’ program includes service-learning internships, initiatives, and courses. APPLES hopes to encourage civic engagement, collaborative efforts, and meaningful partnerships with the community. According to the CCPS website, “As APPLES opportunities have expanded over the years, the primary purpose continues to be to enhance and deepen learning through meaningful collaborations with community organizations among the growing list of programs.” APPLES provides numerous resources and opportunities for students to become more engaged. This program is unique in its dedication to both education and community building through service. The goals of student-led service coalitions accurately embody the spirit of teamwork and community. These organizations are fundamental in impressing service as a basic part of education and also in connecting community organizations and non-profits with the helping hands of empowered students. To capitalize on their impact, student organizations can use NobleHour to streamline communication, the sharing of resources and opportunities, volunteer hour tracking and impact measurement. Service groups can easily see the cumulative number of hours served by members of their NobleHour Community. Additionally, service groups and community partners can post opportunities and relevant content to keep their members in the loop about local initiatives. Skip Paper AND Plastic: One of life’s everyday questions: should you take your groceries home in a paper or plastic bag? It’s one of those decisions we routinely make at the check out line, and it’s an example of how our everyday choices can impact the environment. The truth is neither paper nor plastic is better for the environment. A better alternative is to purchase a few reusable grocery bags. These are inexpensive and can be found at almost any grocery store. Stashing a few of these in your car and remembering to bring them into the store with you is one a simple, sustainable way you can be more environmentally conscious. Service Project Idea: Educate members of your community about the impact of paper and plastic bags on the environment, and encourage them to use reusable bags as an alternative. Reduce Junk Mail: According to 41pounds.org, “The average adult receives 41 pounds of mail each year. 44% goes to the landfill unopened.” Each year, this process results in 100 million trees cut down, 20 billion gallons of water wasted, and 2 billion tons of carbon emitted to produced and transport junk mail. Adding your name to opt-out lists is a simple way to reduce the amount of junk mail you receive. You’ll save time and trees while doing so. Community Initiative Idea: Work with your local community to see how you can reduce junk mail. Encourage your city to organize a mail preference service so residents can easily opt out of junk mail. Read more about how some cities are helping the environment by reducing junk mail here. Conserve Water: Water is a precious resource. The water crisis affects the quality of life of millions of people. In developing countries where clean water is scarce, women in particular are impacted because they need to walk for hours to collect clean water and carry it back. This deprives them of time that could be used for education or work. In addition, once water is polluted with chemicals from manufacturing plants and industrial farm fertilizer runoff, it is difficult to separate the clean water from the pollutants. Water.org has more information about the importance of clean water. Conserving water is not just about appreciating having clean water; it is also an important step in making sure our planet can continue to sustain the human population. Imagine a day without water, and you’ll see how important it is to preserve this resource for generations to come. Improving Your Habits: Take simple small steps in your routine to reduce your water consumption. This might entail taking shorter showers, watering plants only when needed, or plugging the sink to rinse your razor instead of letting the water run. Find over 100 more water-saving tips at wateruseitwisely.com. Recycle: Recycling seems like a no-brainer when it comes to sustainability. The National Park Service reports that “Americans represent 5% of the world’s population, but generate 30% of the world’s garbage.” Reducing waste improves water and air quality, saves money, and reduces the effects of global warming. 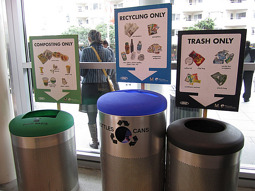 Service Project Idea: While recycling is good, not all materials can be recycled. This depends on the capabilities of your local recycling plant. When the wrong plastic is found in a load of recyclables, the whole batch is sometimes discarded, which defeats the purpose of recycling. Check with your local government and inform yourself on what is and is not accepted in recycling bins. Then, take this information to your community by educating people on how to maximize the benefits of recycling. Build Bat Houses: Bats are a great addition to the environment and are a good pest controller—particularly against mosquitos. Building a bat house that mimics a bat’s natural habitat helps preserve their livelihood. Bat house plans are easy to find online. Eparks.org and the National Wildlife Federation have easy-to-follow instructions on building bat houses. Service Project Idea: Construct bat houses around your community in parks and schools to teach students and neighbours about the importance of bats in the ecosystem. 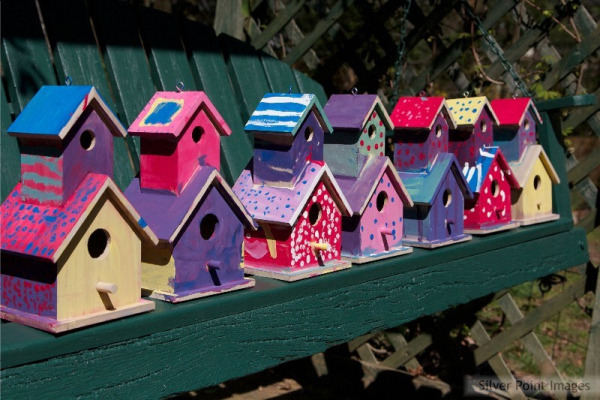 Create Birdhouses: The same idea applies here as with bat houses. Restoring birds’ habitats is a great way to improve your local environment. Here are some resources about starting birdhouses in you backyards, neighborhoods, parks, and schools: http://www.freebirdhouseplans.net/ and http://www.birdsforever.com/. Service-Learning Application: Incorporate this lesson into classrooms by studying the necessities of nesting and the types of birds found in your area. Then, set up a birdhouse so that students can see these birds first-hand. Plant Trees: Trees are important to the environment. They clean the air and produce oxygen for us to breathe. Trees are often cut down to build buildings, parking lots, and roads, so restoring trees is important to any environment. 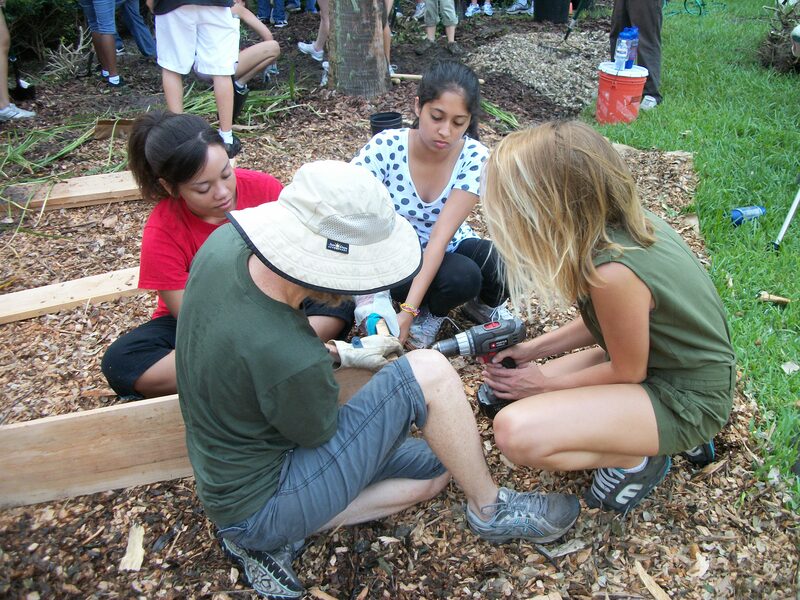 Service Project Idea: Organize a tree-planting day where you and a group of volunteers plant trees in your community. What do you think is the most important reason to preserve our environment? Share your environmentally-friendly service-initiatives on NobleHour to connect with volunteers, schools and organizations interested helping with your cause.